Look no further for healthy BBQ fish recipes that are easy to grill and I'm itching to share them. On this page is a Greek influenced recipe that’ll have you rushing to light the grill and when you’ve checked this one out please browse my complete fish section for more great recipes. 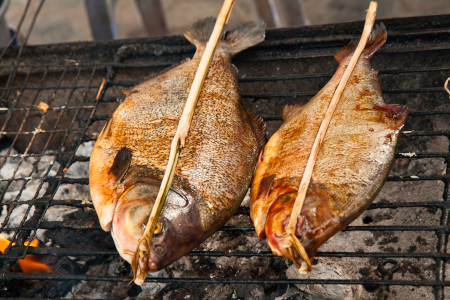 All you need is a hot grill , some small fish baskets or a Teflon® barbecue mat to stop the fish sticking to the grill. I’m not going to be prescriptive about the fish other than to say you need whole fish. Imagine you’re in the warm Mediterranean, a nice small white fish is required, maybe a snapper or small sea bream – as opposed to oily fish such as sardines. 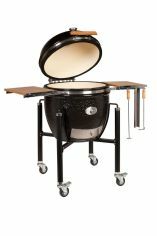 If using all fresh ingredients then the only allergen in this bbq fish recipe is the fish itself. Look out for sulphites however if you choose to use lemon juice from a bottle. Scrape, clean and wash the fish and dry them. Make up the baste using the olive oil, lemon juice and sprinkling with salt and pepper (and oregano) and split it into two halves. Place the fish of a very hot grill and when the fish begins to brown sprinkle with one half of the olive oil and lemon juice mix, turn them over and baste the other side. Turn once or twice again (not too many times) until the fish is cooked and transfer to a hot dish. The whole cooking process should take about 15 minutes, maybe a little longer depending on the size of your fish. Take the second half of the olive oil / lemon juice mix, add a tablespoon of water, some salt and the parsley, whip it up and pour over the fish. Note:- The reason for splitting the olive oil / lemon juice mix into two halves is so that we avoid cross contamination. That which has been used as the baste has (via a brush) come into contact with raw fish so we don't want to use this to pour over the cooked fish.